Dhariwal cares for poplar plants used in the symbiosis experiment. 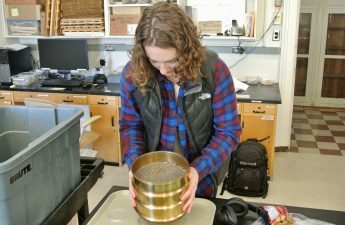 Every week, The Lab Report will feature a different undergraduate-research assistant on campus and their experience in the lab. 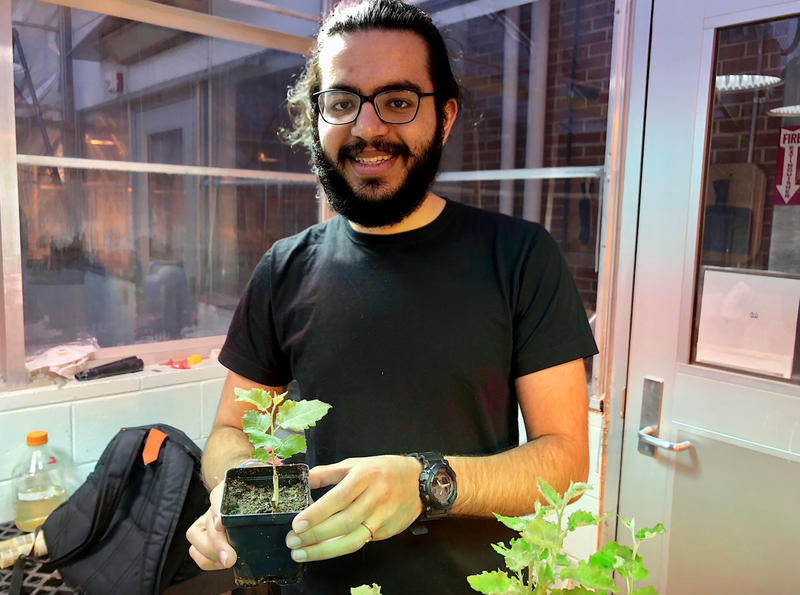 For the last three semesters, University of Wisconsin plant pathology sophomore Angad Dhariwal has been able to explore his passion for plant life by investigating the symbioses of plants and microbes through directed research in the Ané lab. The Ané lab, led by professor Jean-Michel Ané, is part of the department of bacteriology and the department of agronomy. Its many projects seek to understand and manipulate the molecular aspects of beneficial plant-microbe interactions. Dhariwal’s study is focused on the interaction between mycorrhizal fungi and poplar, a woody plant. This work is guided by his mentor, National Science Foundation graduate research fellow and PhD candidate Kevin Cope. Dhariwal’s research efforts are split between the Ané lab in the Microbial Sciences Building and the Ané greenhouse at Biotron Laboratories. 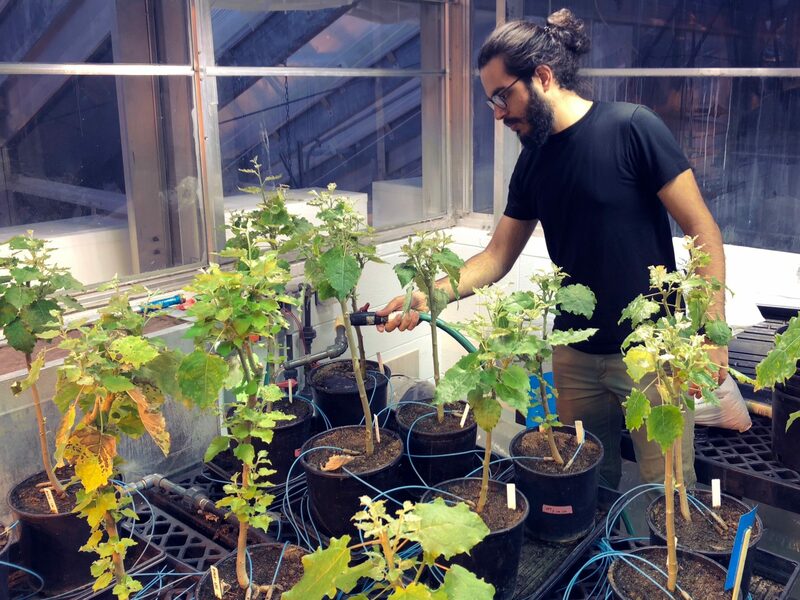 He cares for poplar saplings in the greenhouse and perform analyses of the microbes associated with their roots in the lab. “Mycorrhizal fungi are beneficial root-associated fungi that provide their host plant with mineral nutrients and water from the soil in exchange for carbon-based compounds that the plant produces via photosynthesis,” Cope said. Plant-mycorrhizal associations are complex, Cope said. This research looks at the molecular signaling pathways used to communicate between mycorrhizal fungi and the plants they colonize. In particular, Dhariwal and Cope are interested in nutrient transporters in the plant and fungus to better understand nutrient exchange at the molecular level. To explore this, Dhariwal is looking at one of the many poplar genes involved in the “common symbiosis pathway.” This pathway is present in woody plants and is needed to establish symbiosis with mycorrhizal fungi, Dhariwal said. The specific gene under investigation is important for developing mycorrhizal structure around the root, Dhariwal said. “We want to see if this gene is absolutely vital to this role or if it is just there as a booster,” Dhariwal said. 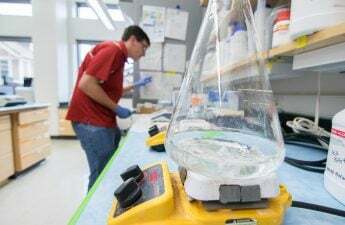 The lab has already used a molecular technique to “knock down” this gene, meaning they reduced its expression. The reduced expression of this gene corresponded to a reduced colonization of the root by mycorrhizal fungi, Dhariwal said. They are going to study how disruption of this gene affects mycorrhizal fungi colonization. If the gene is absolutely vital to colonization of the root, its disruption should result in a complete lack of symbiosis. 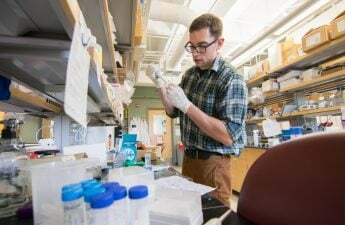 Identifying the importance of the individual genes in the common symbiosis pathway is crucial to understanding the molecular basis of establishment and how the symbiotic association is maintained over time, Cope said. “If we can understand the molecular mechanisms that regulate the establishment and maintenance of mycorrhizal associations, perhaps we can better manage crops to maximize yield and minimize inputs [fertilizers and water],” Cope said. Improving poplar management strategies is important because poplar trees are commonly used as a source of wood paper production and finish carpentry, and are a candidate crop for biofuel production, Cope said. Improvements in their biomass yield will benefit these efforts. In addition to enhancing techniques involving poplar, the knowledge gained through this research might be able to improve other crop management strategies. This is because most plants that humans use as crops for food, feed and fuel naturally rely on mycorrhizal fungi to help them acquire the mineral nutrients and water that they need to survive, Cope said. This is what Dhariwal finds most relevant to his future goals. He wants to work to create food security in developing nations. Dhariwal thinks he might want to conduct research involving engineering food crops to be more drought or disease resistant. Dhariwal is happy that his work with the Ané Lab has helped him learn about research at both the molecular and organismal level. He thinks he’s been able to gain experience that will aid his future pursuits in supporting food security. 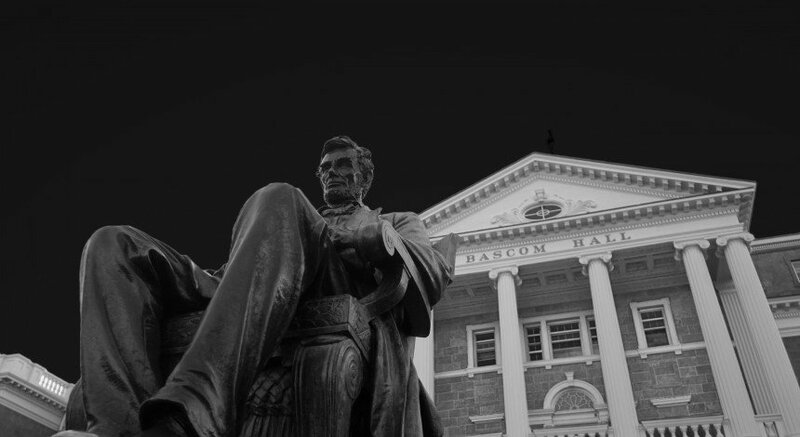 Cope thinks undergraduate research is one of the best experiences for enhancing undergraduate education and gaining a competitive edge for obtaining future employment. He is thankful for Dhariwal’s work and the work of all of the other undergraduates in the lab.